One of the things that attendees look forward to the most when attending SolidWorks World is the sneak peek of the next version of SolidWorks. Attendees were treated to TWO previews this year since the SolidWorks Cloud technology was shown on Monday. Wednesday’s General Session has in recent tradition been the day where we get to see some new features in the software that we will have later this year. Last year SolidWorks went away from doing their traditional “skit” but it made a triumphant return and was as funny (if not funnier) than ever. This year’s skit was the “Super CAD Smack Down”. It had a “Sportcenter” feel to it as Darren Henry & Neil Cook did play by play while Jeremy Regnerus and Ian Hogg tried to one up each other by showing off new features of SolidWorks 2011. Mark Schneider joined them as the “referee”. Ok…on to the new features…. This one is almost self explanatory. SolidWorks has added an “Up to Surface” end condition to the Revolve command. I would assume this command would be available with both extrude & cut options, but only the extrude option was shown. The Defeature tool allows users to take assemblies with large amounts of internal components and convert them to part files. This may not sound like a big deal but there are some nice options with this. You can set which components are removed by the setting a physical size filter in the PropertyManager. In the gearbox example shown, the assembly file was converted to a featureless part file with no internal components or cavity. Only the outer surfaces were preserved. This is a great tool for users who are trying to put assemblies like the example show up to 3D ContentCentral but don’t want to share the details of the internal components for various reasons. In fact there is an option in the Defature tool to upload the model to 3D ContentCentral. Also noteworthy with this feature was the fact that you could come back in and REDEFINE the Defeature and change it at any time. This feature appears to be similar to features in some other CAD packages that are often called “shrinkwrap”. With PhotoWorks being phased out in SolidWorks 2011, Appearances seem to have received some additional settings which appears to be similar to some previous settings in PhotoWorks. You have more fine tune control over the appearance and you can easily pull up a PhotoView 360 preview window within the SolidWorks software. This will allow users to quickly compare what the PV360 rendering will look like as they are applying and tweaking Appearances where in the past the PV360 program had to be launched separately just to see the preview window. Also announced was tighter integration between PV360 and SolidWorks along with the introduction of rendered motion into PV360. Using the simplification tools, you can chose a section of a model and run the FEA on the section itself. With the right scenario, this tool can be used and will save a tremendous about of time since the calculations are only performed on the section. You can then take the resultant plots of the section results and project them onto the 3D model. The Insert Model Item tool in Drawings now places the dimensions in a much more intelligent fashion which should require the user to do less relocation of dimensions within a view and from one view to another. Nothing was shown on how this intelligence is set and if it is configurable. You can select multiple dimensions and more intelligently set the spacing and placement of them using new tools included in the Dimension Palette. When creating a Hole Table in Drawings, the table can now display dimensions using both the primary and secondary units of measure. A swept cut can now be performed at the Assembly level. As an assembly feature, it will not effect the individual component files. The feature only exists in the assembly. You can now add fillets and chamfers at the Assembly level. As with the swept cut, the fillets and chamfers only reside inside the assembly and do not effect the component features. If you have opened the weld bead command in the assembly environment in previous versions, it was one of the few features left sporting the old “separate” dialog box and no FeatureManager integration. Previously, the Weld Beads had to be saved off as separate files and couldn’t even be made virtual. (Yuck!) All of that will change in SolidWorks 2011. The Weld Bead feature is a lightweight feature that works much in the same fashion as the fillet weld tool in the multi-body part environment. The welds are completely virtual and are stored in a folder located at the top of the FeatureManager. I was unable to see if the tool would support multiple types of welds. I’m really hoping that it will. Also – I would like to see a similar if not the same interface in both this tool and the weld tool in the multi-body part environment. We will have to wait and see on that. The new Weld Bead feature supports full weld symbol annotation generation in Drawings as well. You can now insert a Table of all the welds contained in an assembly (or maybe multi-body part too?) in a Drawings. The Piping part of the Routing tool now supports the addition of Weld Gaps. They can be easily added while editing the route and of course will automatically adjust route lengths when used. A new type of camera is being introduced which allows the user to “Walk through” a model. It appears that you can even place an image in the screen to for user reference as you walk through the model. The image is just something to make it appear that you are following someone through the walk through. There was an interface shown at the bottom of the screen while the camera was active that included several types of control buttons which would appear to let you navigate the assembly while the camera is active. Why is there an exclamation point beside this one? Well, this has been one of the higher ranking enhancement requests among users for the past few years. I can remember Charles Culp posting it to the SolidWorks World 2009 Brainstorm site. This feature will essentially allow you to “Freeze” the feature tree for every feature above the point you place the feature. The features that are “locked” will not rebuild until you unlock them. This tool will have its best usage for models with MANY features. Many folks who do complex surfacing will fall into this category. Proper placement of this feature can REALLY cut down on rebuild times! 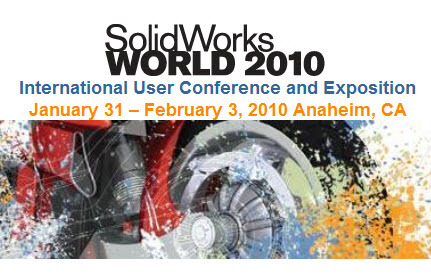 That is all for now…but stay tuned for MORE post SolidWorks World 2010 coverage! Thanks a lot for sharing this wonderful post, Keep up the work going. Thanks for the run down. Looks like some really good stuff. It seems to be good. Going to check it.